Stacy Boegem, JD is fondly known as the Action Instigator and Mompreneur Mentor, as well as the President of Femfessionals Fort Lauderdale. With her remarkable ability to cultivate community and inspire action, Stacy leads modern women to get out of their own way and take action in their business and lives through private coaching, her signature Clarity + Action Mastermind series, and through speaking to audiences large and small. Stacy has been featured in the Wall Street Journal, Women’s E-News, the CW’s Inside South Florida, and others. She has been selected to keynote the Greater Hollywood Chamber of Commerce Business Woman of the Year luncheon, Tulane University’s Women’s Leadership Conference, and is excited to be kicking of her own large scale live event on January 30 in Fort Lauderdale, Connect Relate Activate LIVE! Q. How has motherhood changed your life? Becoming a mother is what led me to do the work I do now. To use my unique strengths and talents to be of service in the world in a way that is so rewarding.Without motherhood, I’d probably still be practicing law! Instead, I get to coach women and spread the gospel of Work/Life synergy far and wide, leading the charge of modern mompreneurs to design their businesses and lives with their own happiness at the top of the agenda. Because happy moms create happy families! Q. Who was the most influential person in your life growing up? At the risk of sounding cliche, it is certainly my own mom. From her incredible work ethic, to her resilience, to her remarkable ability to reinvent herself (she had an illustrious career as an attorney in New Orleans, built a renowned B&B and ran it for many years, and became a successful headhunter for lawyers now with her own firm) she has always done it all without us ever feeling neglected or unheard. In other words, while she has always worked full-time, she’s always also been a full-time mom. If I am doing half as well as she’s done, I’m doing just fine. Q. Twenty years ago, did you ever see yourself becoming an entrepreneur? While I’m a big believer is setting goals and having a big vision in life, I can honestly say that I’ve never been one to plan 20 years out. I truly had no idea 20 years ago what I’d be up to these days! And I have no idea what I’ll be up to 20 years from now! Q. How do you juggle being a wife, mommy, the Ft. Lauderdale President of Femfessionals and running a successful coaching business? The only way I know how: to be very disciplined with my time; avoid multi-taking at all costs, outsource the stuff that’s outside my zone of genius as much as I can, and practice mindfulness. That said, I do recognize that I’m doing too much, and 2015 for me is a lot about streamlining! Q. What can we expect from CRA Live this January? My intention with CRA LIVE is for each person to walk away with CLARITY as to their own best next steps to achieve their business and life goals – inspired to take action. But rather than a fleeting feeling of being motivated, attendees will leave with practical know-how so they can manage their own limiting beliefs and negative self-talk that so often get in the way of personal progress. Each speaker is dynamic, entertaining, and authentic, and has so much to offer our audience. And I’m particularly excited to share my own coach, the woman who has been behind me cheering me on since before I even knew what a coach was – Lois Barth. Lois is a nationally recognized speaker and is coming in from NYC to take the stage – to give our audience a good helping of what I’m so fortunate to get every time we have a session. She is not to be missed! Attendees will make great new connections, learn about their own unique personality advantages and how best to leverage them, and have the tools to turn their new insights into action! Start. Take that first step. Don’t wait for perfect conditions, because they will never come. Believe in yourself. Invest in yourself. Surround yourself with others moms who have started businesses and learn from them. When you have ideas, write them down. When you’re overwhelmed, break down the project into small pieces. And when you have successes, even very little ones, celebrate them! And remember, just because someone else did it one way doesn’t mean that’s the only way. Be true to yourself, and check in with your own inner guide along the journey. Trust your intuition. To stay on track moving forward with support and accountability, consider working with a coach. The amount you progress you will make in such a short time will blow your mind. Most of all, CONNECT with amazing people, RELATE to your prospects and customers, and ACTIVATE your ideas, your plans, your projects by getting out of your own way and taking action. That’s what Connect Relate Activate LIVE is all about! Join me on Friday, January 30, 2015, for a full-day immersive event for smart and driven women unlike anything else you’ve experienced. 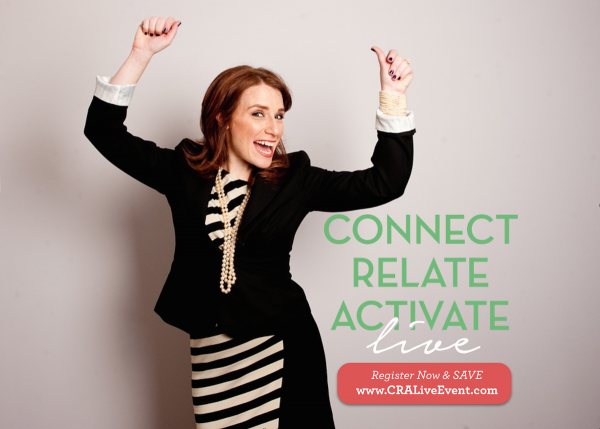 Registration closes at 11:59 PM on Wednesday, January 14, 2015, over at www.CRALiveEvent.com. To get resources and advice for modern mompreneurs, sign up for email updates over at www.stacyboegem.com. You’ll also receive exclusive invitations to my local events for women in business!